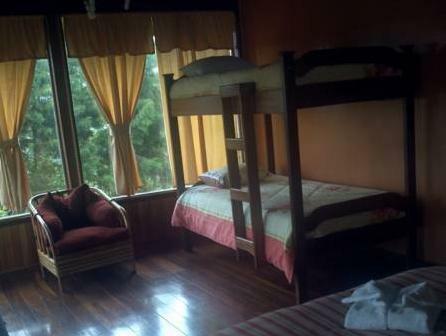 ﻿ Best Price on Volcan Poas-Vara Blanca Tiquicia Lodge in Vara Blanca + Reviews! Featuring fully equipped bungalows with volcano views, Tiquicia Lodge is located adjacent to La Paz Waterfall and a 15-minute drive from Poas Volcano. It offers a garden, playground, camping area and regional restaurant. Shuttle service available from the hotel to the airport complementary and from the airport to the hotel for an additional cost. The accommodations in Tiquicia Lodge features a private bathroom with a shower, air conditioning, a seating area, and BBQ facilities. Room service is provided. Tourist activities such as canopy tours, fishing, hiking, strawberry and farm tours among others, are available less than a 10-minute drive away. Guests can also venture through a path to a virgin forest, a small sanctuary for wildlife. There are 2 large convention centers, a bar, a tour desk, and a front desk service. There is also a common living room with satellite TV, computers with free WiFi, board games, magazines and books. Tiquicia Lodge provides private tours to La Paz Waterfall Gardens, located just a 5-minute drive away and to Barva Volcano, located within a 30-minute drive.The Volcan Poas-Vara Blanca Tiquicia Lodge offers Airport shuttle from the Lodge to the Airport, free of charge. Please inform Volcan Poas-Vara Blanca Tiquicia Lodge in advance of your expected arrival time. You can use the Special Requests box when booking, or contact the property directly with the contact details provided in your confirmation.